Caffeine and green tea: mg comparison of caffeine in green teas, coffee, black tea etc. Effects according to preparation, temperature and infusion. Tips. Contained in around 60 plants, caffeine is an alkaloid (1,3,7-trimethylxanthine) from the methylxanthine substance group. It is sometimes referred to as theine in tea, although this term is considered obsolete among experts. Caffeine tastes bitter and has a strong stimulating effect, which is why it has been used in Asia for thousands of years by Buddhist monks for meditation. It belongs to the secondary plant substances and is primarily formed by the plant to defend against insects (insecticide), microorganisms and other plants. In green tea, caffeine is bound in a particular form and has a strong interaction with L-theanine. According to numerous studies, it has a stimulating effect and >>many major health benefits<<, which are unfortunately not well known. However, it can also trigger adverse side effects in caffeine-sensitive people and children, as well as during pregnancy and lactation. Comparison of coffee, espresso etc. and the most important teas. Which green teas are high in caffeine and which are low in caffeine? Consideration of portion size, range and solubility. Which green teas are mildest and which combinations are useful for whom? Caffeine content is not everything: L-theanine and catechins make it more tolerable. Which green teas have the best L-theanine/caffeine ratio? How does the caffeine content in tea change with a longer brewing time and temperature? Should the first infusion be poured away? Recommended upper limit 200-300 mg per day – how much tea should you drink? Which side effects occur and what do they indicate? Tips for caffeine intolerance. Effect of caffeine in tea from a holistic point of view The numerous health benefits of caffeine in green tea. What to be aware of during pregnancy and lactation in relation to caffeine. What types of tea are advised at this time? How much should you drink? Which green tea combination with a lot of caffeine is useful for increasing your physical performance and for athletes? The comparison of the amount of pure caffeine between coffee, green tea, black tea and other caffeinated beverages is often not precise. Firstly, as mentioned above, it is decisive whether the caffeine is bound to special polyphenols (especially catechins) and which other ingredients (especially amino acids) are present. Secondly, the caffeine content is very different depending on the type of tea (ranging from 0.1% to about 6.2%). Ultimately it is not about the caffeine content in the dry matter, but how much coffee or tea is used for brewing a cup and how much is dissolved in the water during brewing, depending on the water temperature and time. As an exception, the consumption of powdered teas (especially Matcha) should be mentioned, since here the whole leaf and caffeine is consumed. A comprehensive comparison can be found in the >>caffeine content table in mg<<. Young plant parts (buds and young small leaves) have significantly more caffeine than older plant parts (older leaves and stems). The first picking/harvest has significantly more caffeine than the second. Shaded teas (e.g. Gyokuro, Tencha, Matcha) have more caffeine than unshaded teas (Sencha, Bancha, Karigane, Kukicha, Benifuuki). Additionally, it should be noted that a long storage period and especially fermentation reduces the caffeine content, as is the case with the Sannenbancha. * Preparation: 2 tsp, 0.3 l water, 2 minutes, 70°C for Karigane; 60°C for all other green teas. 100°C, 5 minutes for green rooibos tea. A detailed outline of all green tea packages, their caffeine content and all mild varieties can be found in the article >>Green Tea with Low Caffeine<<. These packages are supposed to emulate the most potent of all green tea packages, the basic green tea package (Gyokuro, Sencha, Bancha and Matcha) in a milder effect. Since the basic package contains significant caffeine, it is not suitable for everyone. The package is explained in detail in the article >>Green Tea for Prevention and Diseases<<. While the mild basic package still has quite a potent general effect on health and a significant content of amino acids and catechins; the low-caffeine and low-caffeine package is significantly milder and thus less potent. The health warnings given against the pleasures of coffee and its caffeine are numerous – and not without good reason. Unlike green tea, the caffeine in coffee is not bound to tannin-like polyphenols, such as catechins (= flavanols), but only to chlorogenic acid. 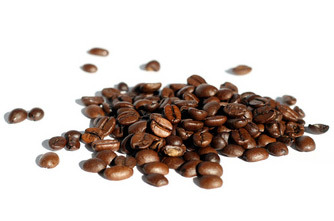 Almost all important flavanols are broken down during production through the roasting of coffee beans. In contrast, the tannins contained in tea act like ion exchangers and, as a result, the caffeine is slowly released in the intestinal tract. Due to the absence of special tannins, the caffeine in coffee enters the bloodstream through the stomach at a higher speed. Because it does not take effect in combination with amino acids, even if a relatively low amount of coffee is consumed, it causes an uncontrolled effect or overdose, and can even produce caffeine tolerance in the nerve cells and withdrawal symptoms. Due to its lack of attachment to the aforementioned substances, caffeine in coffee reaches the adrenal cortex via the bloodstream. There it triggers the release of the stress hormone adrenaline, which has a strong stimulating effect. In order to break down the adrenaline again, noradrenaline has to be released from the body. The unbound caffeine only has a short-lasting effect. This process is stressful for the body as a whole and costs energy. After this stimulating effect takes place, the body is even more exhausted than before. Another very important point is that no amino acids exist in coffee (in particular, L-theanine) – as they do in green, white and high-quality black teas – which makes the effect of coffee significantly less tolerable. Various studies have demonstrated that the unique amount of L-theanine in tea allows the general positive health effect of caffeine to unfold. This likewise applies to other popular drinks such as black tea and Mate beverages. Here the caffeine reaches the body similarly fast to coffee in a high dosage, since it is not bound to the special tannins found in green tea and is significantly less, to not at all, buffered by L-theanine. In black tea, the catechins are converted into aromatic substances through fermentation. However, it should be emphasised that there is a higher content of amino acids in black tea in contrast to coffee (although this is exceedingly greater in green and white teas). The caffeine in black tea is thus somewhat more tolerable than that in coffee, although still much less so than that in green tea. Since the fermentation of the leaves of the tea plant is stopped during the production of green tea, the >>contents<< of white and >>green teas<< are largely spared from the process of oxidation and the resulting chemical transformations. Thus the caffeine remains bound to the abundant catechins and other polyphenols – unlike in black tea and coffee. 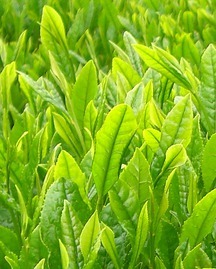 Another important difference is the high content of amino acids in green and white teas, especially L-theanine. This binding, and the combined working of caffeine with the other ingredients present, makes the largest difference between green tea and other caffeine-containing beverages. Because it is bound to tannins, the caffeine in green tea mainly enters the blood through the intestine, and works in interaction with the other valuable ingredients to produce a very mild and long-lasting effect. This allows the extremely healthy benefits of caffeine to unfold very well in the body. In contrast to the caffeine in coffee, the tannin-bound caffeine in green tea has little to no direct effect on the adrenal cortex. It stimulates the central nervous system, which leads to a much gentler release of adrenaline. Accordingly, noradrenaline is only released gently, if at all. The effects of the caffeine in green tea thus lasts much longer. The health benefits of caffeine do not depend solely on the content of the beverage in milligrams (mg), but rather on its interaction and binding with the other ingredients. Numerous studies have pointed to the positive properties of caffeine in green tea. It should be emphasised that studies in recent years have highlighted very healthy properties even of caffeine in coffee, which is not bound to tannins (here in particular in the Arabica coffee variety). Studies have shown, for example, the reduced risk of Parkinson’s disease due to caffeine consumed in coffee (1.). Caffeine has also reduced the dopaminergic neurotoxicity of Parkinson’s disease in animal experiments (1, 2). These findings are becoming ever more widely recognised. Of course, this only applies to the consumption of relatively small amounts; the caffeine limit for healthy adults is set at around 300 mg per day. Through the roasting of coffee beans polycyclic aromatic hydrocarbons (PAH) are created, which have a known carcinogenic effect (3). This is not the case with teas that are not heated to high temperatures. It should be noted however that PAHs are frequently found in tea samples, especially from China, where the teas are heated or roasted in a pan. Fortunately, both coffee and tea are usually only consumed in small quantities, which limits the number of PAHs found in the drink (3). Smoked foods, such as smoked hams, contain much higher amounts of PAHs. However, if any side effects do occur – such as discomfort, nervousness, stomach upset, or similar – it is recommended to take precautions until the symptoms are tolerable or have completely subsided (see below). People react differently to the caffeine in green tea. Although it is bound to tannins and is more compatible with L-theanine, it can still induce significant >>side effects<< ranging from sleeplessness, dizziness, stomach pains to headaches.